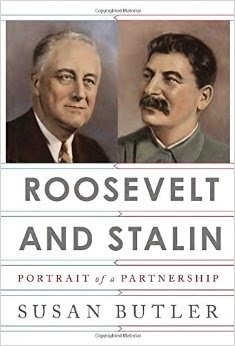 Veteran journalist and author Joseph C. Goulden takes issue with Susan Butler's Roosevelt and Stalin: Portrait of a Partnership in today's Washington Times. Should I feign surprise? Decades after communism collapsed into rubble, the blame-America crowd — ah, those “intellectuals” — remains determined to blame the Cold War on President Harry S. Truman and British Prime Minister Winston S. Churchill. Such is the thesis lamely touted by Susan Butler in a book slated for fireplace duty once cold weather returns. Ignoring history, she maintains that virtually every postwar decision the United States and Britain made concerning the Soviet Union was wrong. Fortunately for history, unlike President Roosevelt, determined to give Stalin the benefit of the doubt on contested issues, Truman and Churchill had a better historical perspective on the dictator’s record. That he caused the deaths of millions of fellow countrymen during the 1920s and 1930s and worked to overthrow other nations is of no import to Ms. Butler. What alarmed Truman and Churchill was Stalin’s blatant breach of a host of agreements, including permitting Poland to elect its own government. Not only did the Communists install a dictated government, they imprisoned opposition Poles who had resisted the Germans from exile in London. Her book’s framework is the weeklong Yalta Conference in the Soviet Crimea in December 1945, to discuss the imminent unconditional surrender of Nazi Germany, the organization of postwar Europe, the Soviet entry into the war against Japan and the founding of FDR’s dream, the United Nations. Much of the book is lifted directly from the State Department’s Yalta volume in the decades-old “Foreign Relations of the United States” series. There is considerable irrelevant padding — for instance, ad infinitum listings of persons with whom FDR shared meals, and the (astounding?) fact that he read his mail. The "fireplace" comment might be the most scathing statement I have ever read in a review. Anything else the reviewer can say is simply icing on the cake. But it is very taste icing! Joe Goulden is a very clever and intelligent reviewer. I enjoy his reviews. He is also a grand journalist and very good author of non-fiction books, from "Korea: The Untold Story of the War" to "The Death Merchant." You might be interested in "The Death Merchant," as the book is about a guy who worked for naval intelligence, then the CIA, and he went on to work for the kook dictator in Libya. Good book.